Matte lightweight. 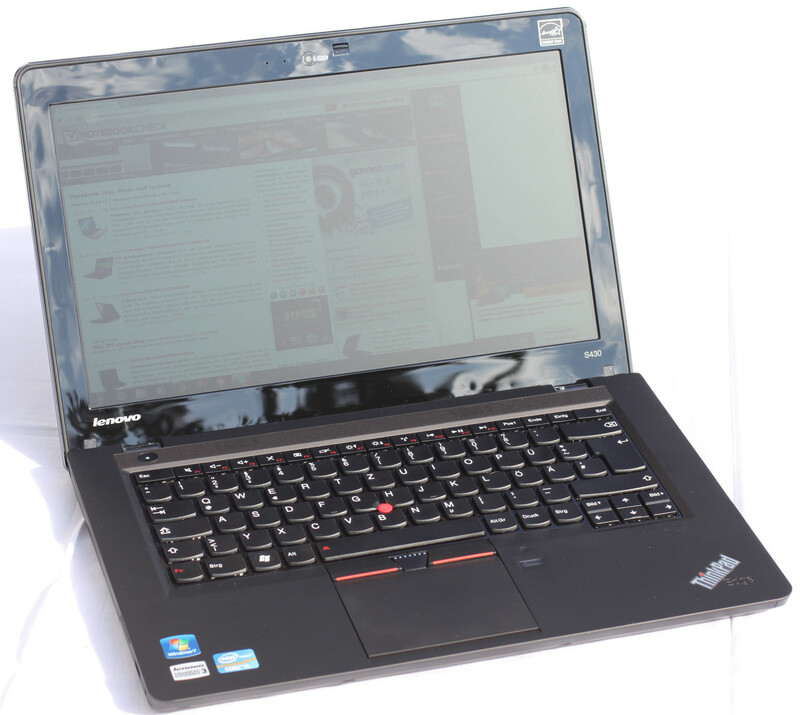 With the ThinkPad Edge S430 Lenovo brings another offspring of the Edge family on the market. The specially marketed as a cheap business notebook should win both the personal user and the SMEs with a high-resolution matte display - does the undertaking succeed? 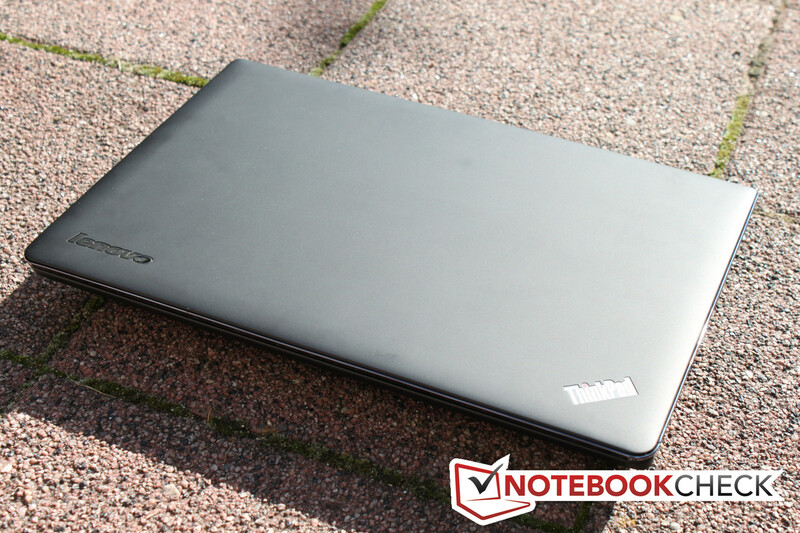 In the beginning of last year, Lenovo recognized the need for a business notebook in the lower price segment and brought the ThinkPad E420s on the market. Since the start of July the current ThinkPad Edge S430 is available, and should have the same goals and be designed with high productivity for the small and medium business in mind. We also clarify whether or not the newest offspring of the Edge family can assert itself over rivals such as the Acer TravelMate P643-MG-53214G75Mikk and whether the premium appearance of the ThinkPad line is maintained. The S430 presents itself much like any other ThinkPad, familiar and conservative on the desk, no stand-out design, no eye catchers. 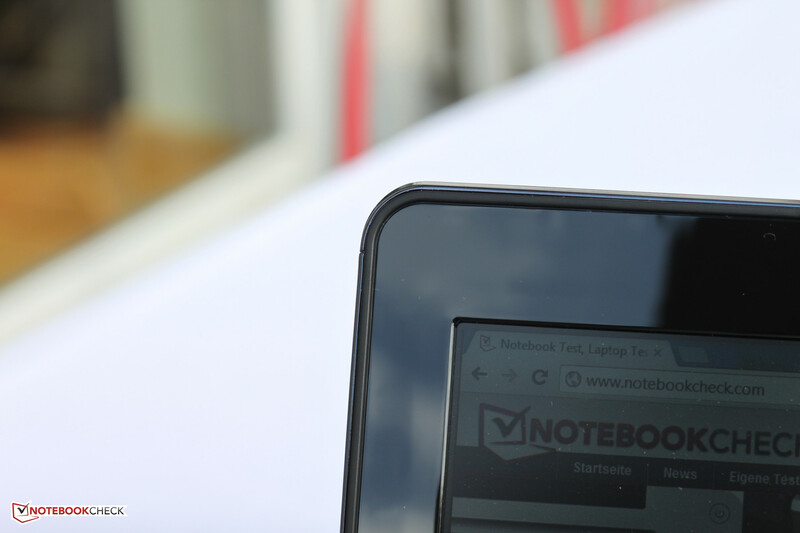 Only at a second glance does it become clear that the device, announced at CES 2012, is part of the newer generation - when the display lid is opened, the owner of the notebook is welcomed not only by a black plastic surface, but also by a chiclet keyboard. By the time one hears the name of the device it should be clear that this is no ordinary home or consumer device. With the new Edge S family, the Chinese manufacturer attempts to offer business notebooks for the small budget. Small companies, entrepreneurs and freelance professionals are considered the target group, namely those who need reliable performance, but do not have an inexhaustible budget at their disposal. 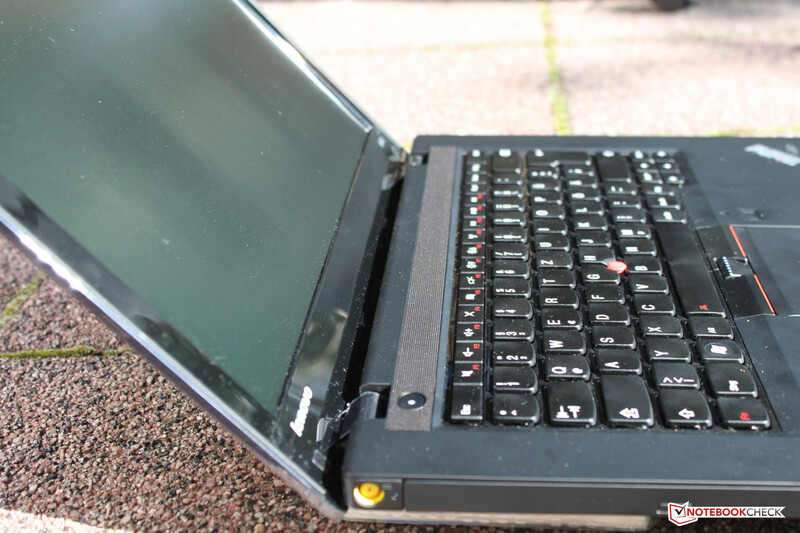 The biggest points of criticism of the ThinkPad E420s were in terms of the display and the workmanship: Rarely is a glossy display useful in the work environment. In addition, the resolution of 1366x768 pixels was sometimes not sufficient. Another fault was the workmanship and the stability of the lid - this was easily twisted, while the hinges did not adequately prevent teetering. Our review shows if Lenovo has learned from its mistakes and therefore sends its in-house alternative model better equipped in the race. Our test unit arrived with the Core i5-3210M, a GeForce GT 620M and also 4 GB DDR3 of RAM. 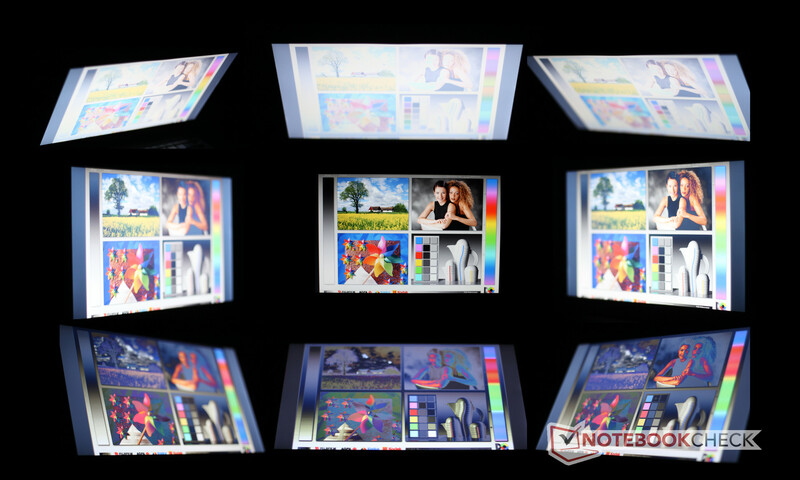 The display has a resolution of 1600x900 pixels and has a matte surface. The notebook also comes with 500 GB storage space as well as a 16 GB solid state drive. The notebook present itself in matte plastic. The 14-inch notebook is designed in the true meaning of the word dull. 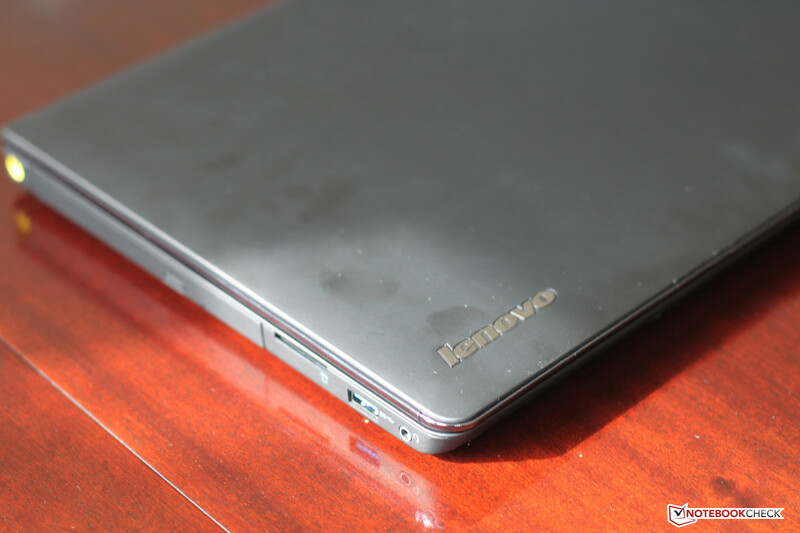 Except for two LEDs on the lid and on the body of the device, both incorporated into the ThinkPad logo, Lenovo relies on plastic and brushed aluminum with a soft touch surface. An exception is the display bezel that has a reflective, fingerprint-prone, piano black lacquer finish. 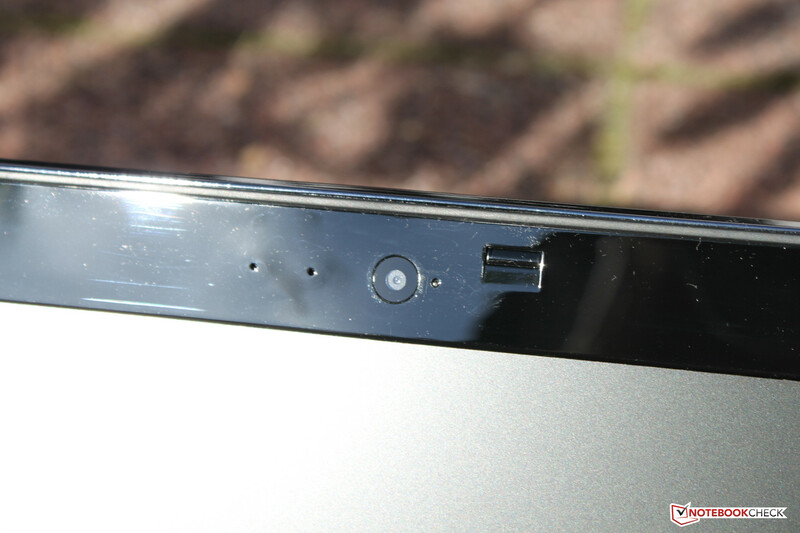 Fingerprints also have a role on the rest of the device: The matte plastic surface does not forgive any touch, although this can be seen only under oblique lighting. Other than the display bezel there are few reflective elements built-in: These are the keyboard background, between the individual keys of the chiclet keyboard, and around the edging of the display, although this is only visible when the lid is closed and is a slick accent. The lack of torsional rigidity of the display lid, which we criticized in the predecessor, could have been considerably improved through the use of an aluminum plate. Indeed the lid can still be twisted - given a certain force is exerted - although a creak or a similar noise cannot be heard. Things look differently, and this time in a positive sense, when considering the stability of the body. Except in the areas of the DVD drive and the fan it is almost impossible to depress the device more than a millimeter. The body is still very rigid in the areas mentioned and no damages here are to be expected. 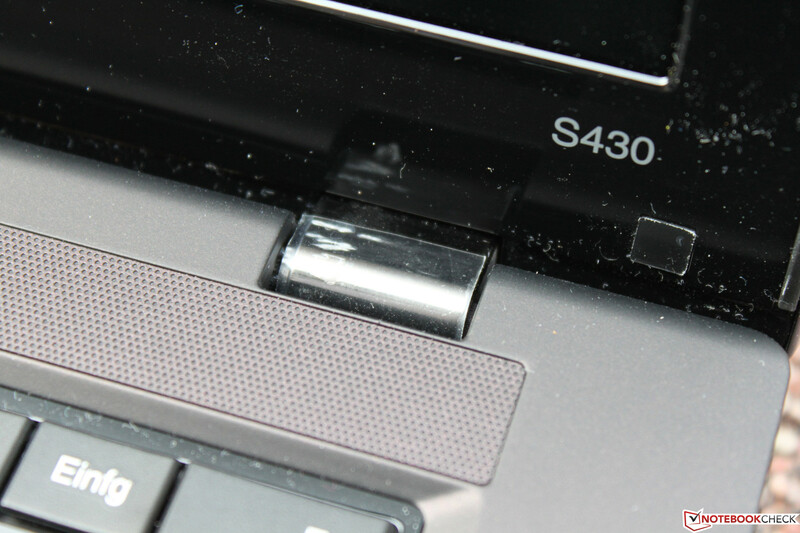 Other weak points of the E420s, namely the inadequate mounting of the display and above all the teetering, can be detected only to a small extent in the S430. The metal hinges hold the 14-inch display of the notebook firmly in position. In terms of workmanship we determined no weaknesses whatsoever - all the edges are cleanly rounded off and large slits or gaps do not exist. 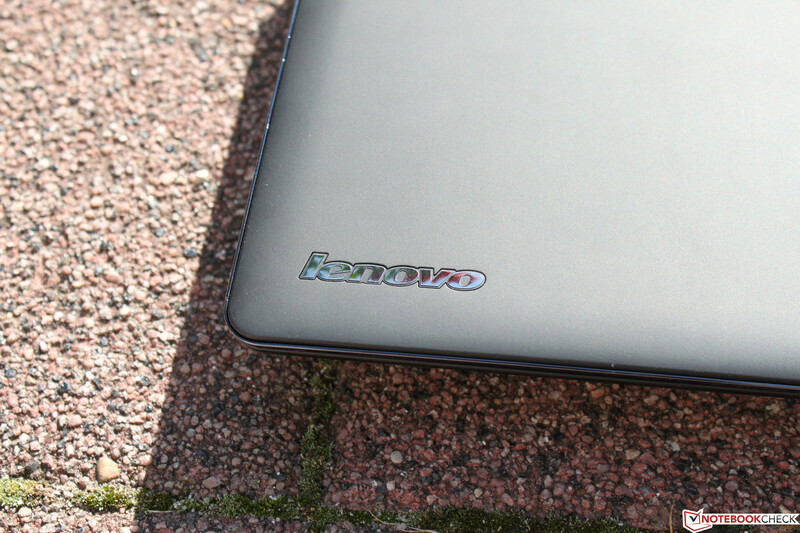 Especially in terms of weight Lenovo has done a convincing job. 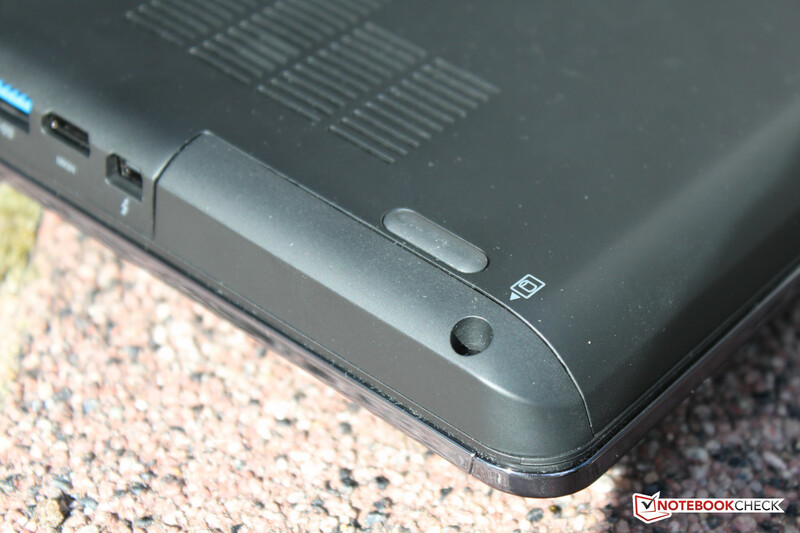 With a weight of 1.85kg (~4.08 pounds), the Edge S430 is considerably lighter than rival devices. The Acer TravelMate P643 weighs about 500g (~1.1 pounds) more and Toshiba's Tecra R840 about 150g (~0.33 pounds) more. Here a good balance between rigidity and weight has been found. 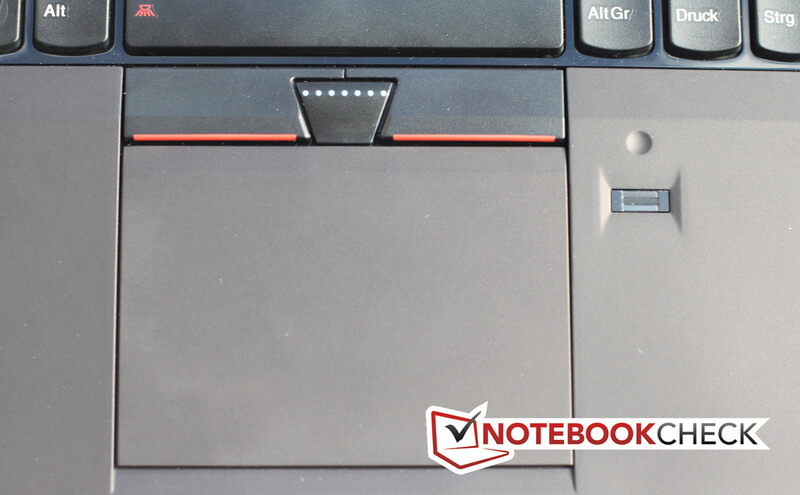 The ThinkPad Edge S430 comes with an average number of interfaces. On the left side are the AC jack, a card reader and a USB 3.0 port. Next to these a headphone/microphone combo port has also found a place. 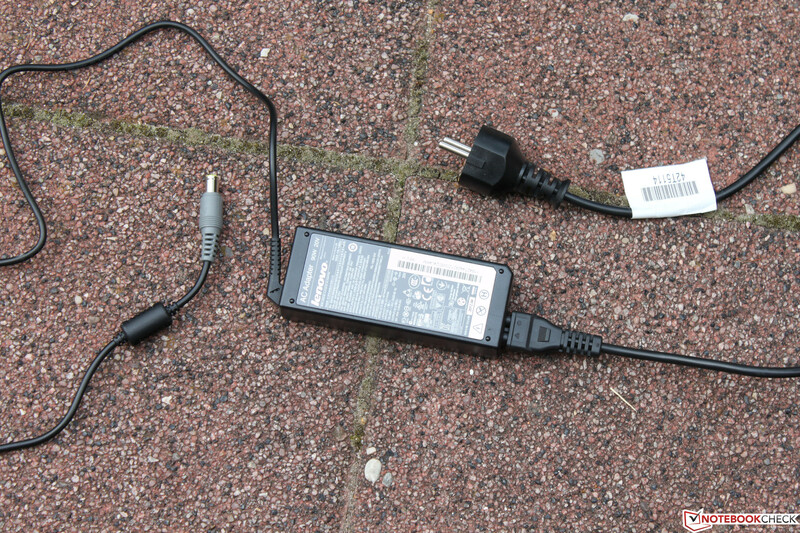 Thus an adapter is often needed when using standard PC headsets. 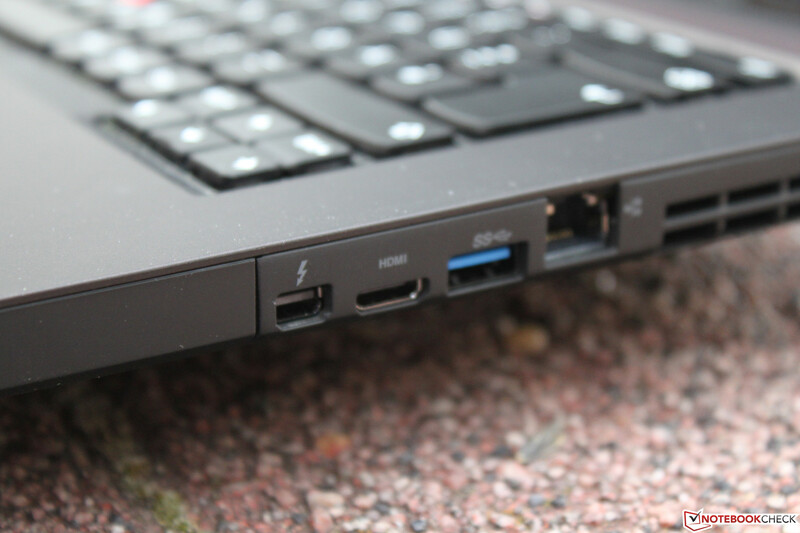 The right side of the notebook features more exclusive ports. The first we see is a Thunderbolt port, marked with a lightning bolt. Thunderbolt is an interface developed by Intel in cooperation with Apple that should in the future support a number of different peripherals. The first external hard drives with this port are already available. Next to the Thunderbolt port we find an unusual mini HDMI port, which is hard to spot at first. This one does not only support the protocol with the same name, but also serves as a combo solution for devices that use the DisplayPort interface. Because there are only a few devices that use the mentioned port, one should carry an adapter, either a VGA or at least a DVI one, when traveling. In addition, on the right side we find another USB 3.0 port and a wired network port for the Ethernet controller made by Realtek. The front side of the notebook houses no ports and the back has an SIM card slot, which in our test configuration served no purpose. When using an external mouse on the right side, one can have problems because of the LAN and mini HDMI ports. A more sensible positioning of those interfaces would have been on the back of the notebook or at least at the rear of the sides. 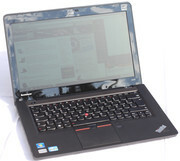 The communication interfaces of the ThinkPad Edge S430 are typical for the class. Through the cable, one can connect with 1000 Mbit/s to the local area network or the Internet, while 300 Mbit/s are possible using wireless. Here Lenovo uses the Intel Centrino Wireless-N 2230 that supports among other things Multi-Stream, while the wireless 802.11 a/b/g/n standards are there as well. The reception cannot be faulted. External devices such as mice, keyboards or mobile phones can connect directly to the device using Bluetooth 4.0. The integrated HD webcam does a fair job and provides a webcam-adequate image even in low-light situations. 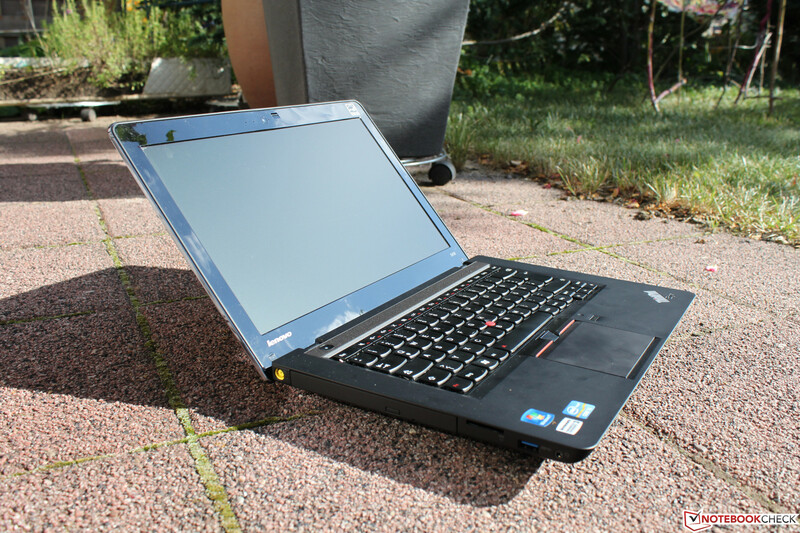 The ThinkPad standard equipment is appropriate for the target group and the S430 comes with several safety features. These include not only a Kensington Lock, but also a fingerprint scanner. It can be set up in just a couple of minutes through the Lenovo software and works flawlessly afterwards. The accessories included with our test device are a bit meager. 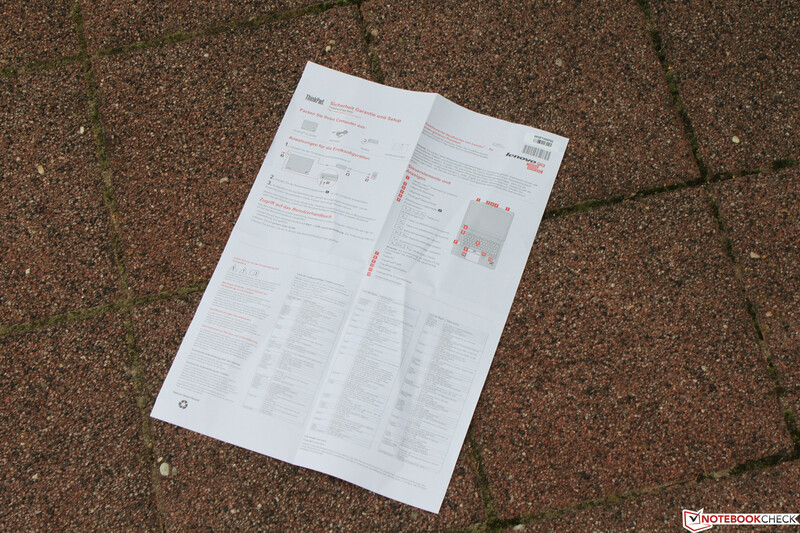 Besides the notebook itself and the power supply there are only a couple of folded pamphlets in A3 format, which inform about the device, first steps in using it and the terms of the warranty. Unfortunately a CD with drivers is not supplied and neither is a recovery CD. The latter however, can easily be obtained; a look at My Computer reveals a drive with the needed data. When double clicked, a dialog box opens with the option to write the corresponding disk. Software-wise Lenovo supplies the S430 with a couple of in-house programs, Microsoft Office Starter, as well as a 30-day trial version of the Norton Internet Security. A docking station (USB) is at the time of the review not available for the S430. In Lenovo's online shop merely the Lenovo Easy Reach monitor stand is available, which should help out with the organization of the accessories on the desk. The maintenance capabilities of the ThinkPad S430 are disappointing. To replace just the battery, the whole upper side of the device must be removed; this includes the keyboard and the optic drive. Only after removal of the whole media and card reader board, do we gain access to the integrated battery. The removal of only one screw, as a look at the device suggests, is not enough. 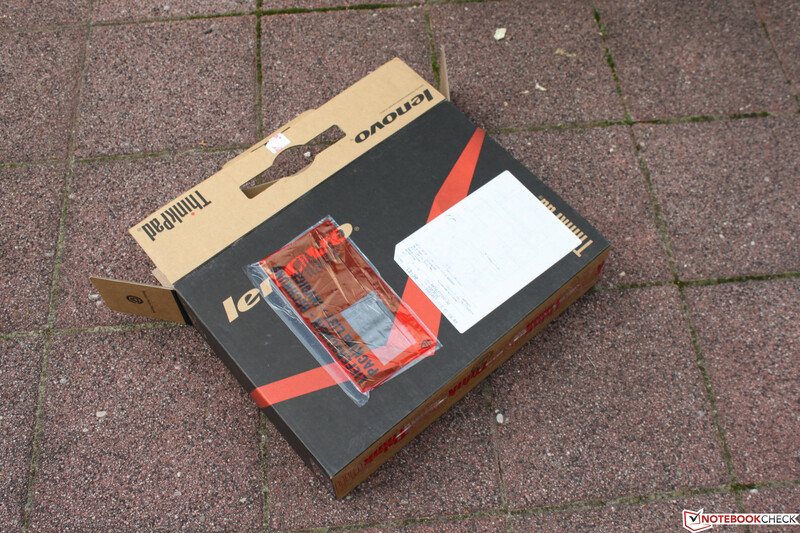 The same goes for the rest of the components, only here a partial access to the bottom side is needed as well. 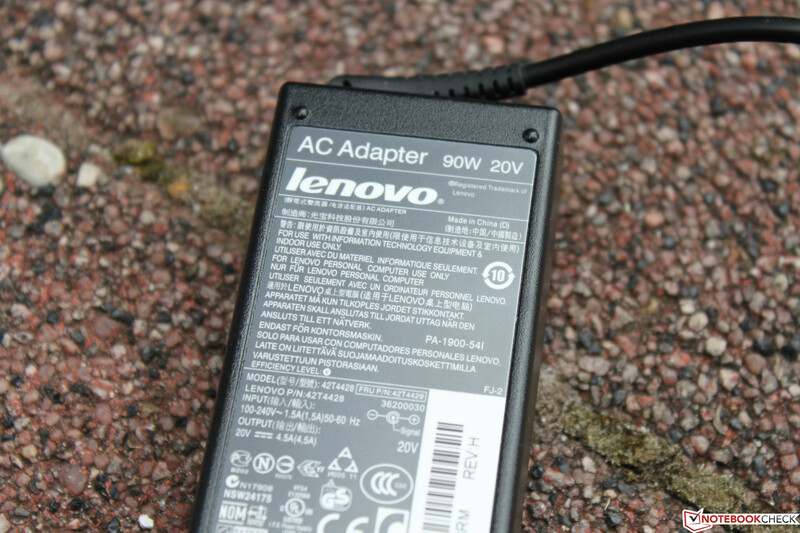 Lenovo provides the S430 with a warranty period of one year. This can of course be extended for a surcharge. There are different two- and three-year options to choose from, costing between 50 and 230 Euro (~$62 and $284). Among others, a next business day exchange or sending the product are possible. The statutory defect liability period of two years remains unchanged. 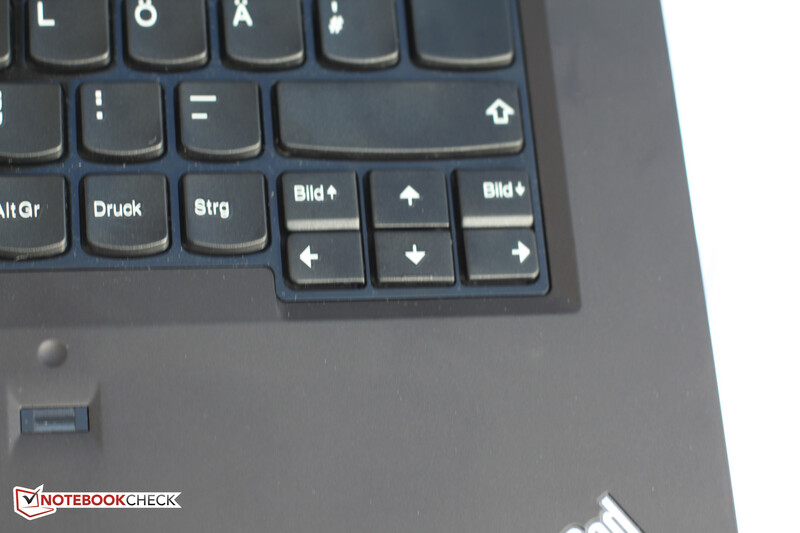 The keyboard of the Edge S430 has surprised us: With a clear pressure point and a somewhat sharp stroke, Lenovo has managed to build a keyboard with a very good typing experience. The numbered keypad on the right has been omitted, because the considerably narrower keys would have hindered smooth typing. The 15 x 15 mm (~0.6 x 0.6 inch) large keys are curved slightly inwards in a concave shape and are rounded off on the user's side. An exception is the top row of keys, which are all rectangular. A blind "grasp" of the keyboard will take some practice. Like many other notebooks, the keyboard comes with a couple of peculiarities in terms of the key layout. The arrow keys are sticking a bit out of the keyboard's border and the "Page up" and "Page down" keys are located over the left and right arrow keys. 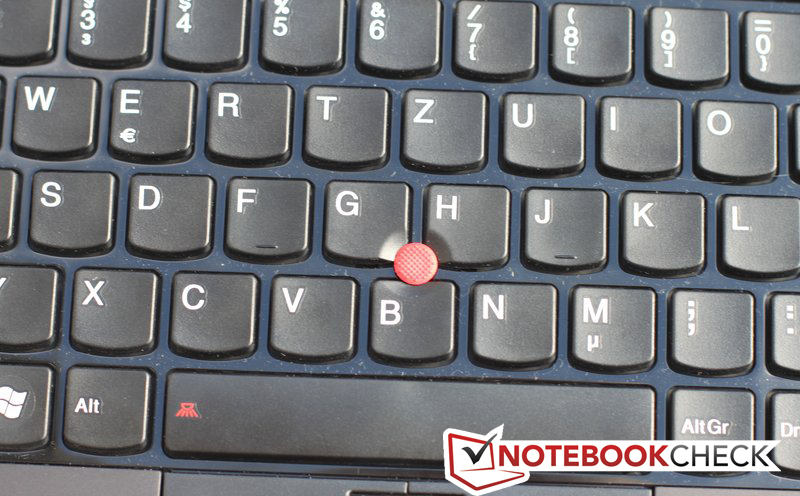 "Home", "End", "Insert" and "Delete" have found their place next to the function keys, which work as standard controlling the notebook's hardware (brightness, volume, wireless communication, media keys, etc.) and become the "F" keys only after the use of the "Fn" key. 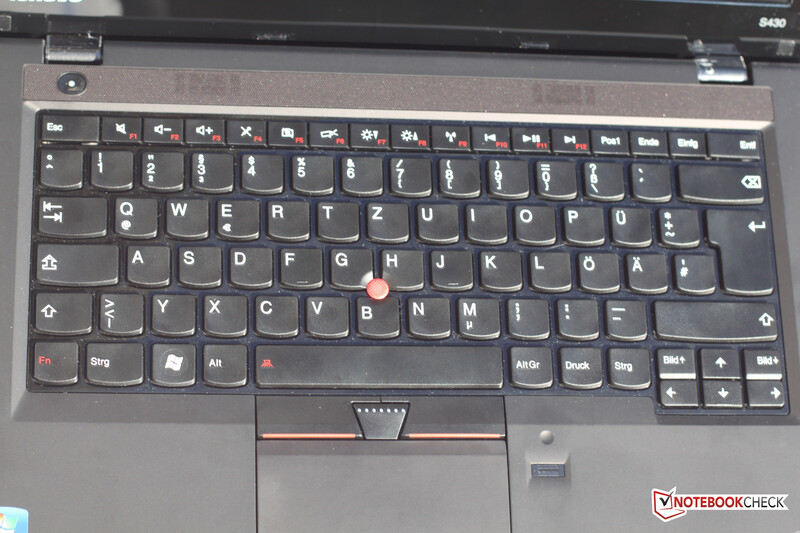 The so-called "Fn" key has, typically for Lenovo, switched places with the "Ctrl" key, which can easily be changed from the BIOS menu. 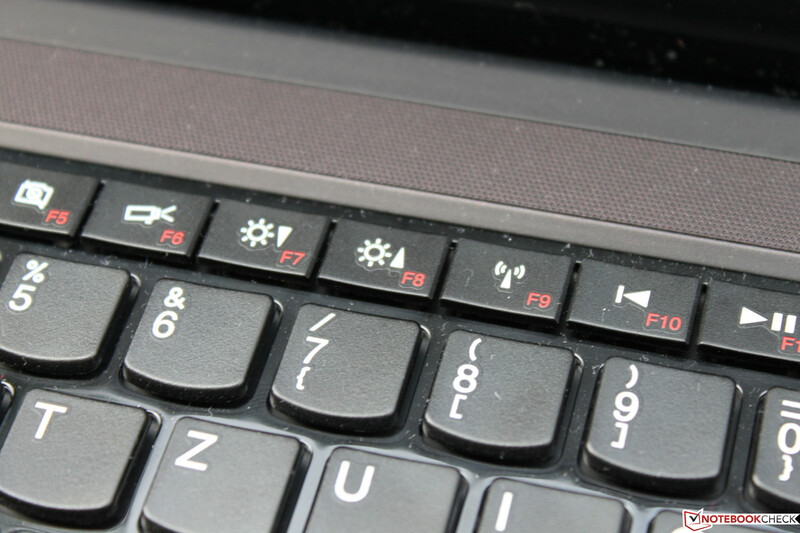 Those who want to use the F1 through F12 keys without the Fn key, can also change this function in the BIOS menu. The touchpad reveals a couple of weaknesses: Both single and double clicks are sometimes not registered right after waking the notebook from standby or a system start. A click can be issued either through a light touch of the pad or through a strong, mouse-like click. 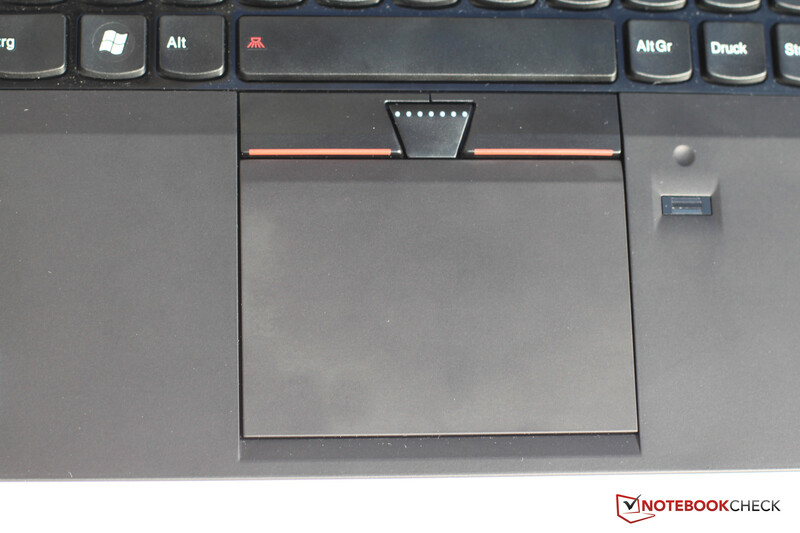 The needed pressure increases in the upper part of the touchpad, until a click is no longer possible. Multi-touch gestures are registered flawlessly and the finger movement causes no problems thanks to the smooth surface. 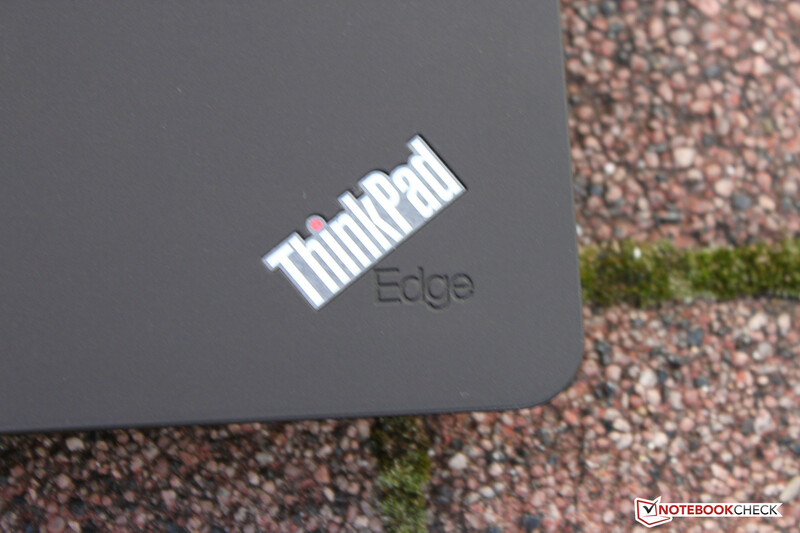 In a good ThinkPad manner, the Edge S430 also features a TrackPoint. 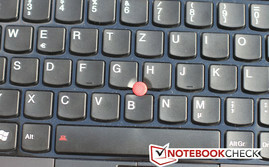 It functions perfectly and is a good alternative to the touchpad. 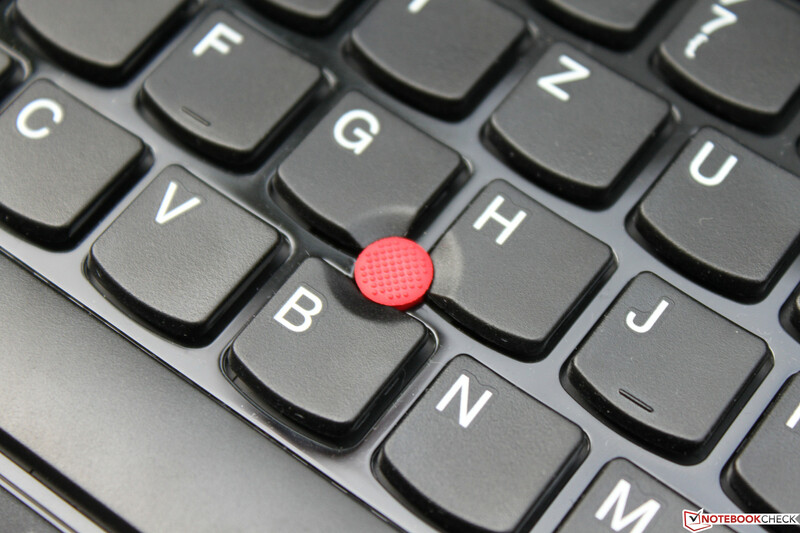 The TrackPoint middle button, placed between the two mouse buttons, makes scrolling through documents or using the internal Microsoft zoom function possible. Until only a couple of months ago, the Chinese manufacturer was still relying on the glossy display, so beloved by the Asian region. With 1600x900 pixels the matte display offers enough working space without making the fonts too small. Those with impaired vision can of course increase the font size accordingly in the Control Panel. 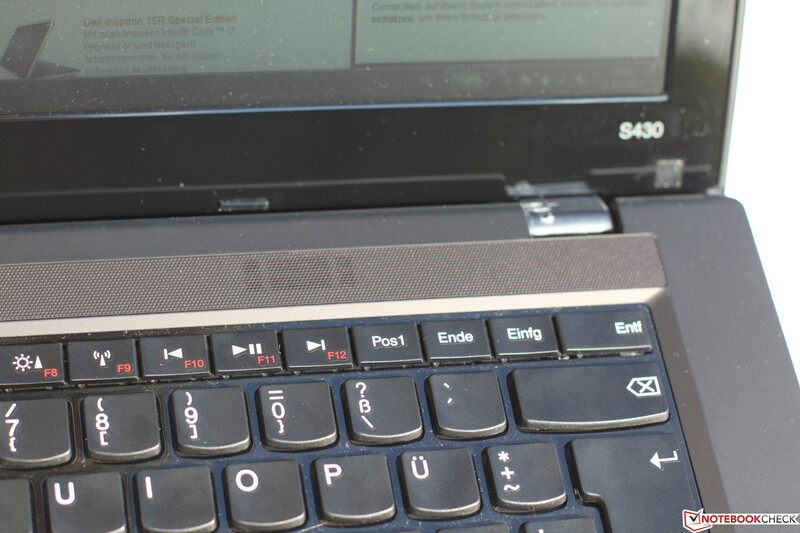 The matte display allows for work both indoors and outdoors. Although the matte screen does make things look subjectively darker in brighter environments, working in direct sunlight is not possible - here more than the 216 cd/m² average brightness is needed. Overall the display is typical for the class, partially above average. 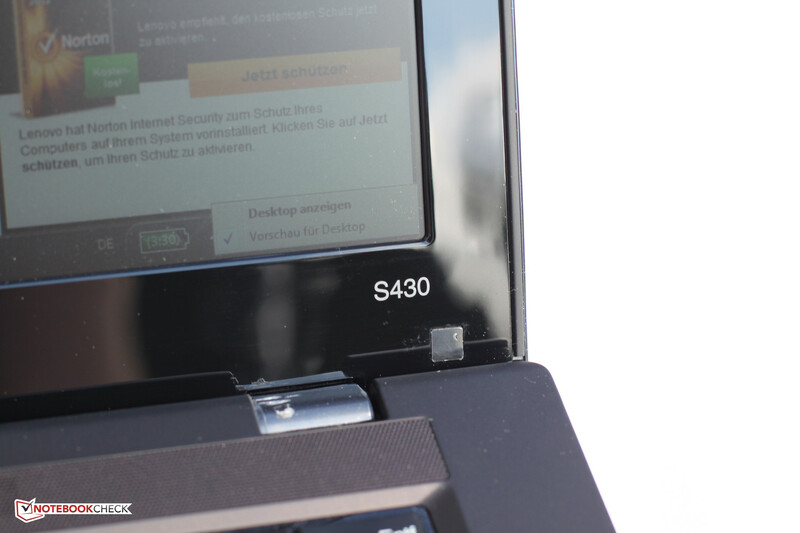 The display of the Acer TravelMate P643 for example is darker and offers worse contrast and black levels. The other values of the display are no cause for joy either. With a contrast of 169:1 the displayed colors are dull and pale. This is also reflected in the black levels, whose 1.33 cd/m² leaves us wanting more. Subjectively the measured values are to be confirmed in this regard: The color reproduction is not going to knock us off the table, but is still acceptable. Overall these figures are the price a customer has to pay for a matte display in this price range. 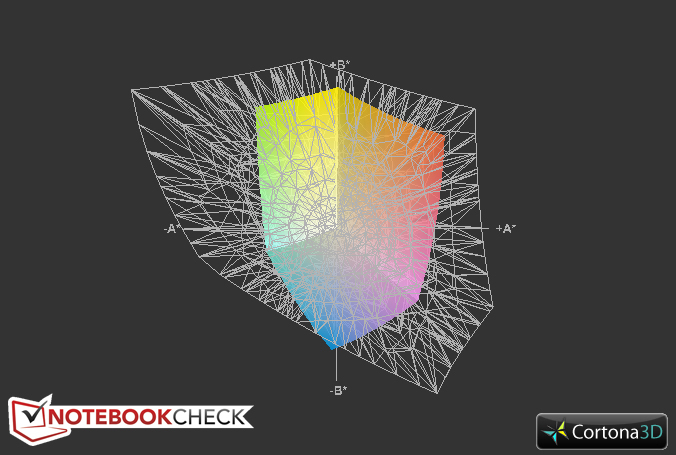 To the already known results falls the coverage of the color spaces: Neither sRGB, nor AdobeRGB are fully covered. However, it is important to note here that in both the blue and the yellow spaces the display comes very close to the profiles. On the other hand the purple and green are lacking in color - one should keep in mind though that this is only really important to professionals. And they are looking for a notebook with a bigger display anyway. The comparison with the Acer TravelMate P643, mentioned in the beginning of the article, went interestingly: The color spaces are almost identical, but the display of the Edge S430 easily trumps that of the P643. Despite the low contrast and black levels, the true strength of the display is in outdoor use. In a bright environment there are no disturbing reflections and the panel is bright enough to display images and text without any difficulty. As already mentioned this changes when the sun shines directly - then the average brightness of 216 cd/m² is simply not enough to display a visible image. 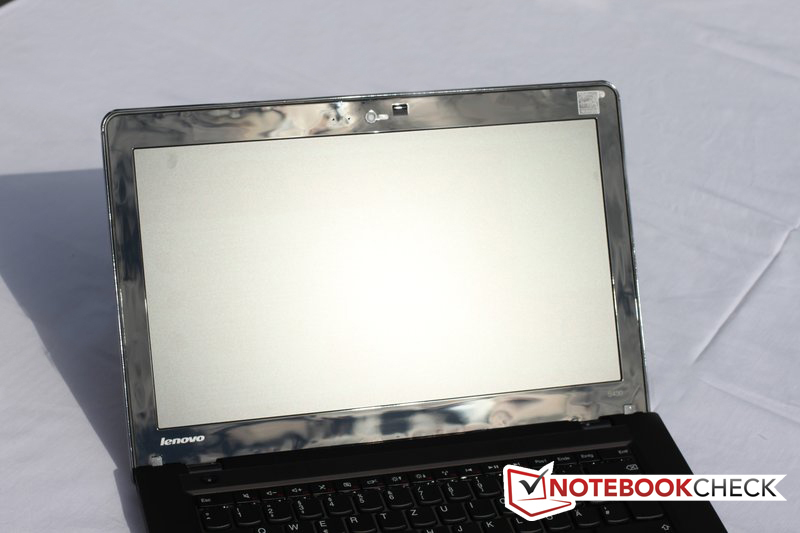 In terms of viewing angle stability we are satisfied with the notebook. Color change is only noticeable over 45o in both vertical directions. This phenomenon is not observable in the horizontal angles - other than a slight darkening of the picture, nothing similar can be seen. The reviewed notebook is available in various online shops in two different configurations. First off, there is the one we are reviewing, which comes with the Intel Core i5-3210 processor, the Nvidia GeForce GT 620M and 4 GB DDR3 RAM (N3B3EGE). The 970 Euro (~$1199) model N3B3DGE, which is 200 Euro (~$247) more expensive, comes with an Intel Core i7-3520M and features a total of 8 GB of system memory. Users must do without the dedicated graphics card, but receive instead a WWAN module that supports most current wireless standards. The cheaper configuration here goes more towards the light and portable multimedia notebooks, while the 970 Euro (~$1199) model aims towards high mobility and performance without the additional UMTS devices, having the better processor and the WWAN module. 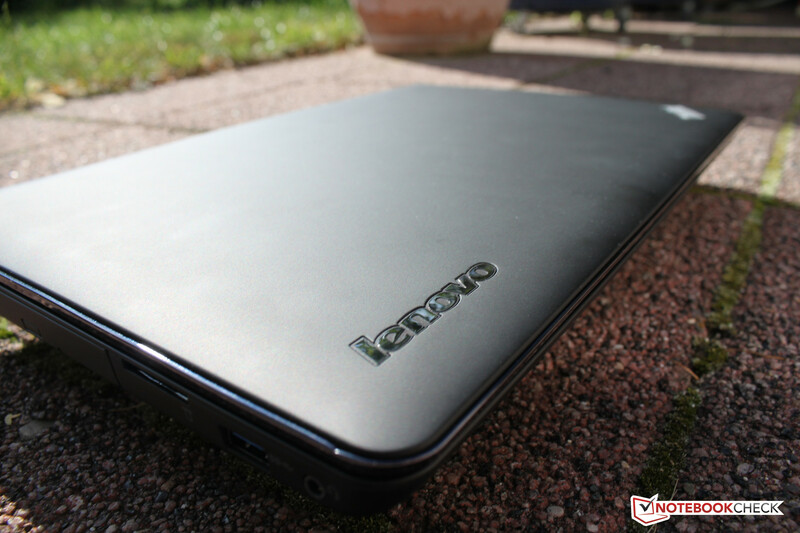 In order to provide sufficient computing performance, Lenovo relies on the Core i5-3210M. It is based on Intel's latest Ivy Bridge architecture and is manufactured under the 22 nm process thus achieving a very high degree of energy efficiency. The base clock frequency of 2.5 GHz can be increased through Turbo Boost 2.0 - given the corresponding increase in load. The two cores can work at 2.9 GHz and a single core can reach 3.1 GHz. Thanks to Hyper Threading in the Task Manager the CPU register two additional cores. The TDP (Thermal Design Power) of 35 W includes the integrated Intel HD Graphics 4000. We'll take a close look at it later in the review. In terms of the Super Pi Benchmarks, the S430 with the 3210M ranks among the lower places overall. 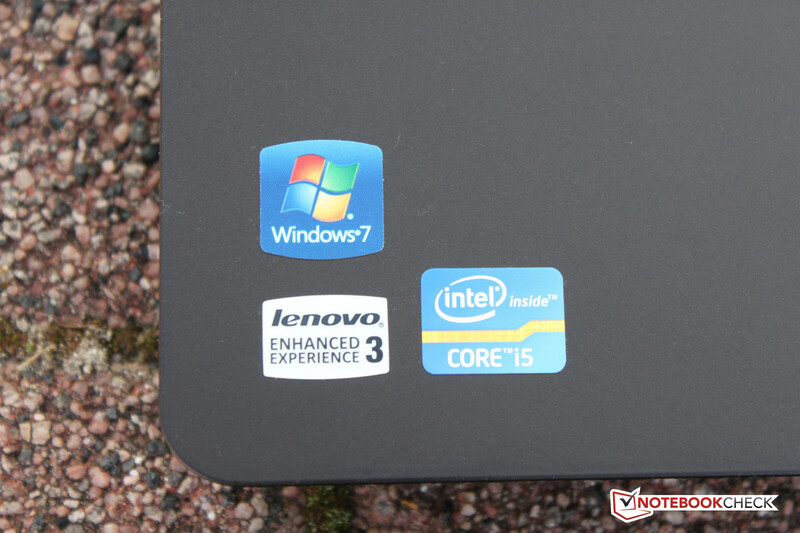 We compared our test unit to other notebooks, even those with the same Core i5-3210M. The result from the Cinebench R10 64-bit (Multi) tell a different story: The tool positions our device in the middle of the ranking with a total score of 10986 points, while the single CPU variant places it with 5005 points at the bottom of the table. A look at the CPU speed during the benchmarks shows a frequency of 2.9 Ghz, which is below the Turbo Boost maximum. This could explain the lower result, compared to other devices, in the single CPU benchmark and the reason could be traced to the S430's lower cooling reserves. Performance losses in mobile use (battery) could not be detected. The notebook worked at the usual speeds without problems. With the tool PCMark Vantage the overall performance of our system can be tested. The benchmark divides the result in 7 individual ones, each of which gives information about the performance of a specific component. The total score was 7653 points, which overall is average. The lowest score in our benchmark was the gaming and graphics processing one. Here the device is clearly limited by the GeForce GT 620M, which is positioned in the lower middle class. Responsible for the notebook's good overall score is the result of the communication's test - with 10580 points it even reaches the five digit range. During this benchmark the CPU's and the hard drive's performance are tested, thus thanks to the processor and the hard drive a correspondingly good score is achieved. 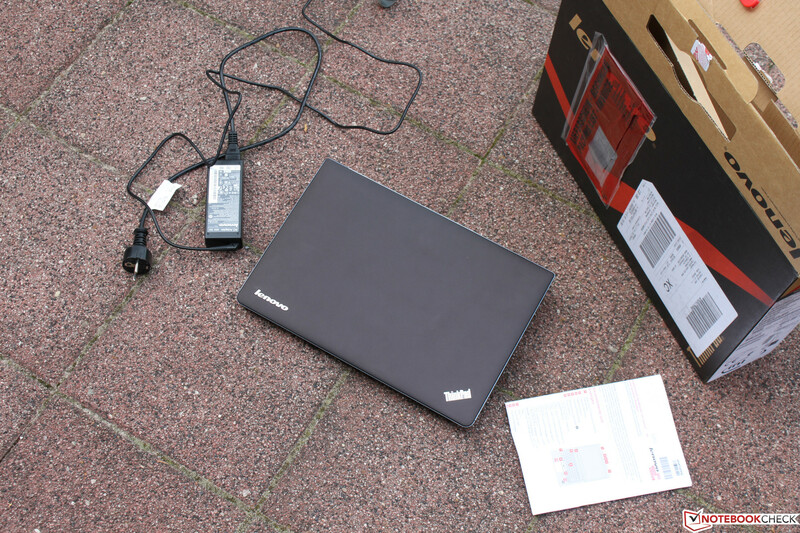 During our test we could work smoothly with the S430. No real stuttering or disruptions were observed. 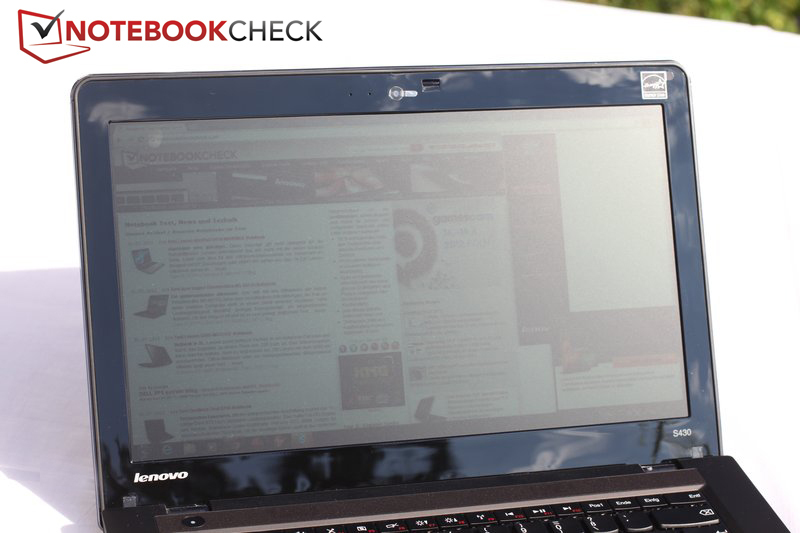 With 7653 points in the PCMark Vantage our test notebook considerably outperformed its rivals. This goes not only for the afore-mentioned Acer TravelMate P643 (6556 points), but also for the HP ProBook 6465b (7349 points), the Dell Vostro 3450 (6225 points) and the TimelineX 8473TG(6209 points). By including a 16 GB caching SSD, Lenovo tries to significantly increase the hard drive and the overall performance of the system. When looking at the benchmarks it all seems to work fine. 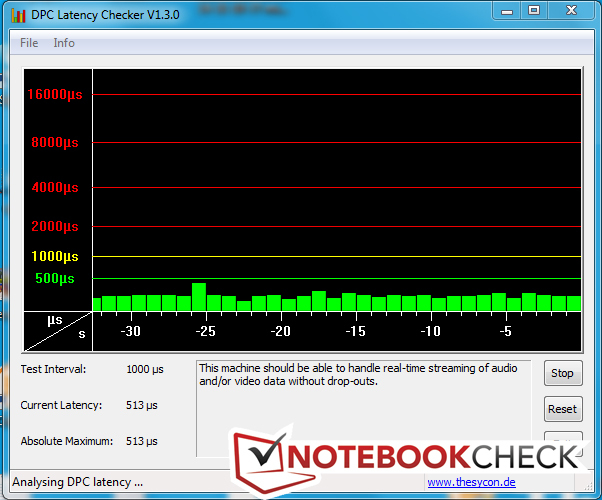 With HD Tune we measured an average writing speed of 105.3 MB/s, with this reaching 137.4 MB/s at the highest point. A normal hard drive can only reach 70 or 80 MB. The installed Hitachi Travelstar Z7K500 has a sufficient size of 500 GB. Through the USB 3.0 or the Thunderbolt this space can be further increase using a fast external drive. The 7200 rotations per minute seem to deliver a good performance in the HD Tune benchmark, but also are responsible for increased power consumption. The above mentioned caching is only available through the built-in Sandisk U100 SSD. The 16 GB is factory-ready for caching. It is not recognized by Windows Explorer and can thus not be used as an additional hard drive, especially since with only 16 GB it would be filled extremely quickly. Caching SSDs speed up, above all, recurring processes. 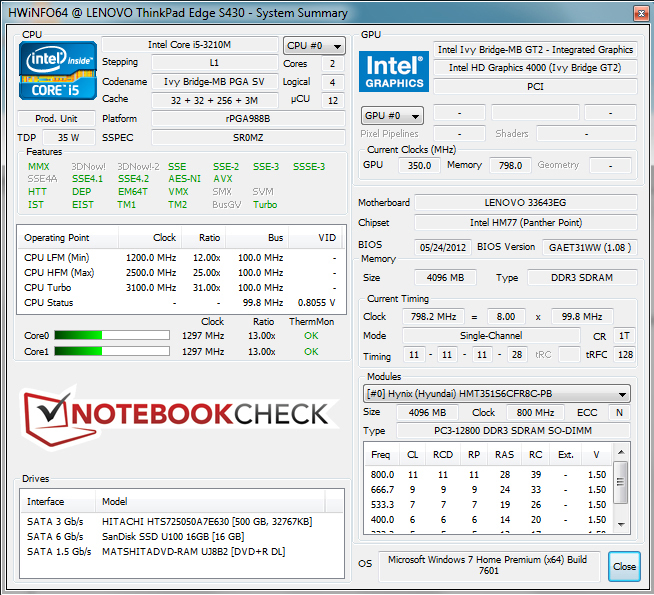 The SSD's sole benchmark with HD Tune (AS SSD did not recognize the device) shows an average transfer rate of 181.3 MB/s. This speed also shows that the SSD is no longer part of the latest generation and as such ranks in at the end of our table. Overall we are satisfied with Lenovo's solution: The performance and the read and write speeds were significantly and noticeably increased through the use of the caching SSD. However, this team does not come close to the performance of a single, full-fledged SSD. The cheaper configuration of the reviewed notebook comes with an Nvidia GeForce GT 620M in addition to the integrated in the processor Intel HD 4000. It shows up in GPU-Z as having 2 GB DDR3 SDRAM and especially in games comes to aid of the installed Core i5-3210M. Nvidia Optimus is responsible for the automated graphics switching, which has so far worked without any problems. Very rarely do users need to manually choose the correct graphics card either through the Windows interface or the driver. While in desktop, office or sometimes multimedia use, the energy-saving HD 4000 does all the graphics operations. 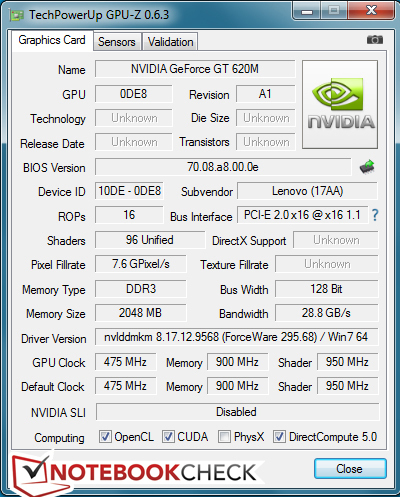 Only demanding graphics applications (games for example) automatically activated the dedicated GT 620M card. This card had, in our test unit, the old GF108 chip. Because of the older architecture (40 nm instead of 28 nm) it consumes somewhat more energy and emits more heat. What is positive here is that Lenovo has used the 128-bit memory bus version - otherwise the already significantly over-sized 2 GB graphic memory would have been poorly used. During our test, we observed a throttling of the GPU down to 475 MHz instead of the officially claimed 625 to 715 MHz. This lower clock frequency might be the result of the older manufacturing process and the corresponding increase in heat emission. During our gaming benchmarks the GT 620M reached a temperature of 89 °C, while the room temperature was only 24 °C. The memory frequency seemed unaffected by the throttling and ran under full load at 900 MHz according to the specifications. The situation looked different under our stress tests with Prime95 and Furmark. While the under-load situation with the CPU remained as previously described, the clock frequency of the GPU was further throttled and fell to 237.5 MHz. The lowered clock frequency was also evident in our benchmarks. 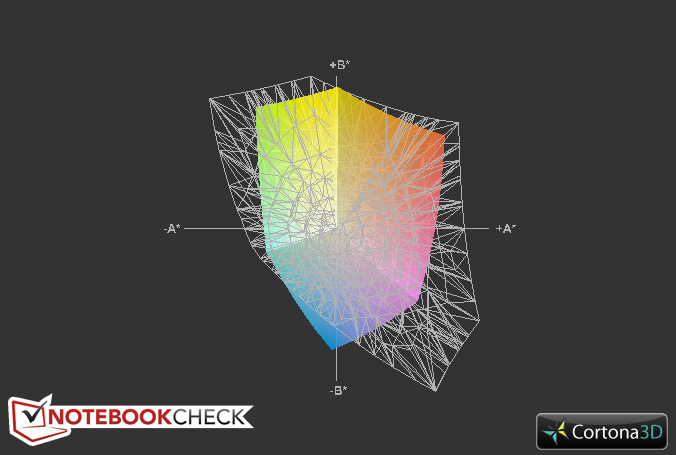 In 3DMark 11 the notebook achieved only the below-average 793 points. During battery operation things did not change - at least there was no further throttling of the graphics card. GPUz log file: The graphics card reaches the very hot 89°C. Without question there are better notebooks for gaming, for example the Lenovo Y580, but for the sake of being thorough we will have a look at the S430's performance in a couple of modern games. In view of the mixed results from our graphics benchmarks we were excited about the more realistic results in the gaming field. Surprisingly we could not observe any performance drops. While some older games are playable even with the HD 4000, EA's Battlefield 3 practically requires a dedicated graphics card. Although the game was playable at medium settings it was not enjoyable. We could opt to play it at 27 fps on lower settings. "The Elder Scrolls V: Skyrim" proved to be a bit less demanding. We could still enjoy the opening scene at medium settings as we were being taken as prisoners through the area, but lowering the setting increased the performance from 27.1 to 36.3 fps. Particularly interesting was the benchmark of Anno 2070, where we could compare our results with the unthrottled GT 620M, namely in the Acer Aspire V5. 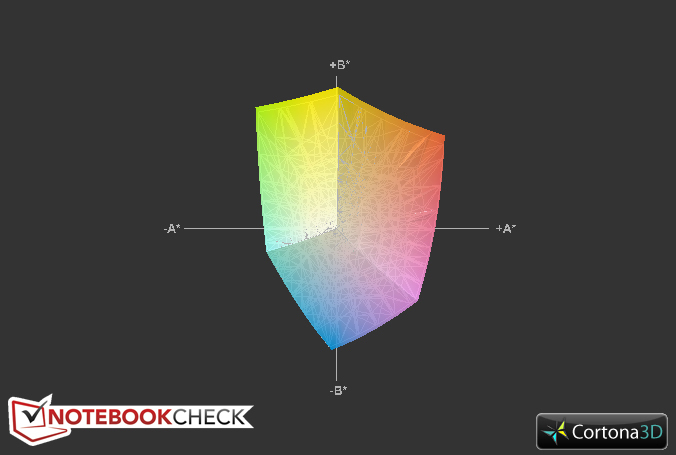 While at lowest presets our notebook reached 55.6 fps, others could reach as high as 81 fps. The case remained the same at medium settings, even though the difference was "only" 10 frames (38 vs. 28 fps). At high settings we did not notice any noteworthy difference in the frame rate. 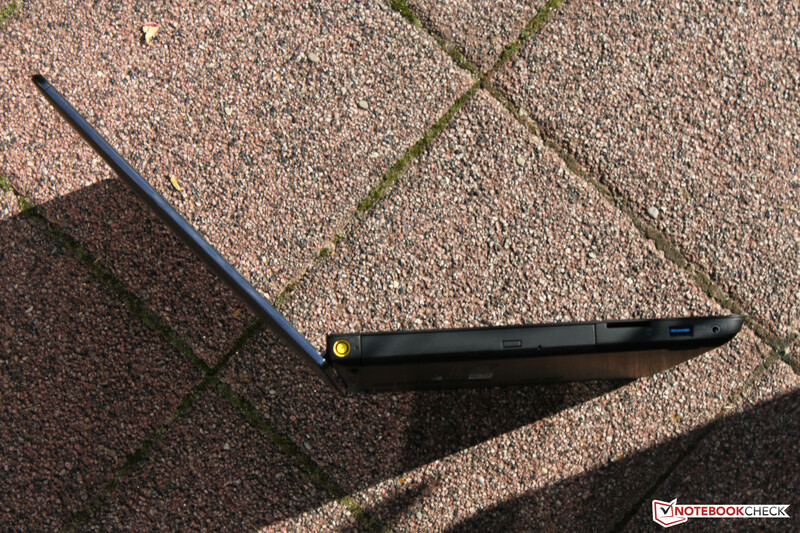 Although the Lenovo ThinkPad Edge S430 was not designed as a gaming notebook, one could play some of the modern games at lower to medium settings. A prerequisite in most cases however, is that the native 1600x900 resolution is not used - at this point the performance of the dedicate graphics is just not enough. The performance is therefore, considering the previously mentioned throttling, at the level of the GeForce GT 540M and is clearly seen throughout. Further benchmarks of the (unthrottled) GT 620M can be found on the information page of the GPU and also on our benchmark list. The basis of productivity is the quiet working environment. In order to work efficiently with the Edge S430, not only is a good battery run time crucial, but also a low noise emission. Noise comes from, above all, the fan, which has put a monkey wrench in the works of so many office notebooks with dedicated graphic cards. Here Lenovo delivers overall good results. In energy-saving mode and our Reader's test, the fan spins very slowly and was practically silent (30.7 dB(A)). The hard drive was also not noticeable, except for copying large files, thus leaving the notebook pleasantly quiet. During our DVD test the fan was audible, but remained at a comfortable level and did not disturb our movie experience. This picture changed drastically in our gaming benchmarks: The fan was clearly audible in order to dissipate the heat out of the notebook, but fell short of sounding like an aircraft turbine. There was no annoying whine or an unbalanced fan control with uneven rotation speeds and continuous volume changes observed. In idle mode the temperatures remained in the green zone. With an average of 32.3 °C on the upper side and 35.5 °C on the bottom side the device remained not exactly cool, but still in acceptable levels. But even here the fan vents in the upper right section of the keyboard were noticeably warm, with a temperature difference of up to 12 degrees compared to the lower left edge. The palm rests were indeed warm, but not uncomfortably. In the stress test the heat of the 89 °C hot GPU must be dissipated. Thus the temperatures of almost 50 °C in the area of the fan vents are not surprising. Even more drastic is the situation on the bottom side of the notebook where the temperature reaches 60 °C. Of course we are talking about a full load scenario with both the CPU and GPU working at full capacity, which is unlikely in practical use. During our DVD test it was feasible to watch with the notebook on the thighs - no excess heat in comparison to the idle mode was observed. As part of our stress tests, we proved that the notebook and the CPU throttled. A couple of minutes after the start of the test, the frequency of both cores dropped from 2.9 to 2.5 GHz (the base clock). No further throttling of the cores was noticed. Things look different with the GT 620M GPU: As mentioned before, the clock frequency dropped to a meager 237 MHz. (-) The average temperature for the upper side under maximal load is 39.6 °C / 103 F, compared to the average of 29.4 °C / 85 F for the devices in the class Office. (-) The maximum temperature on the upper side is 49.1 °C / 120 F, compared to the average of 33.9 °C / 93 F, ranging from 21.2 to 62.5 °C for the class Office. (±) In idle usage, the average temperature for the upper side is 32.3 °C / 90 F, compared to the device average of 29.4 °C / 85 F.
(-) The palmrests and touchpad can get very hot to the touch with a maximum of 42.3 °C / 108.1 F.
(-) The average temperature of the palmrest area of similar devices was 28.2 °C / 82.8 F (-14.1 °C / -25.3 F). Especially in view of the possible multimedia use the speakers of the notebook are relevant. 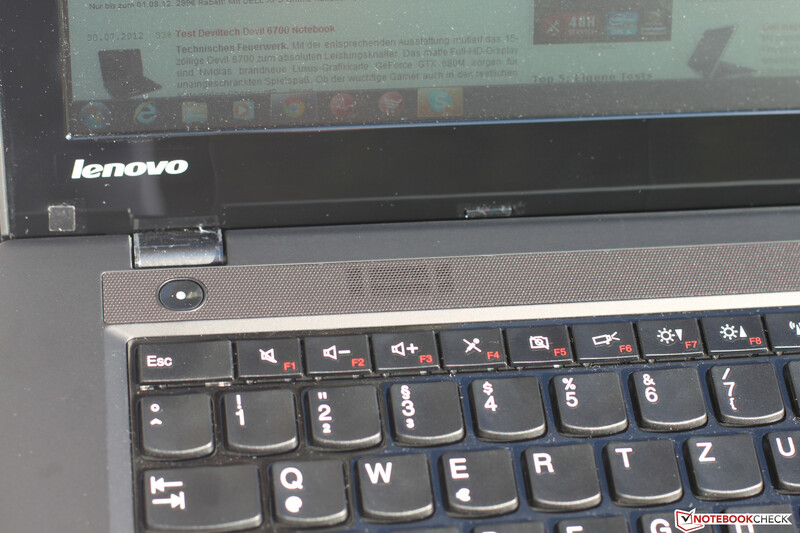 Lenovo has installed stereo speakers, which are located between the keyboard and the rear end of the notebook. They produce the highs of our chosen music authentically. The same goes for the operation at maximum volume - the speakers do not distort and even fill the room with an acceptable level of sound. Considerably worse is the case with the bass. If at all produced, the speakers just creak - otherwise the bass goes completely unnoticed. 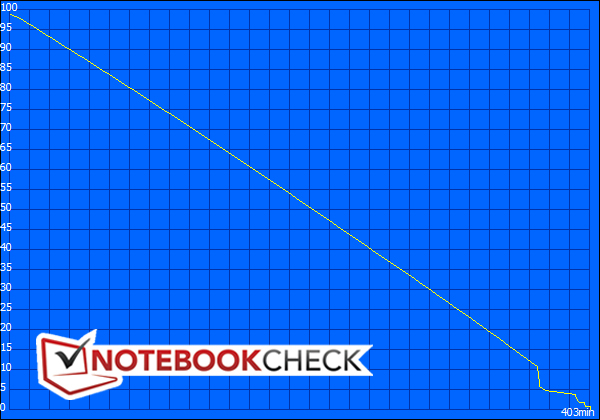 The power consumption of the notebook is generally at reference level and only rises under load to about the average. 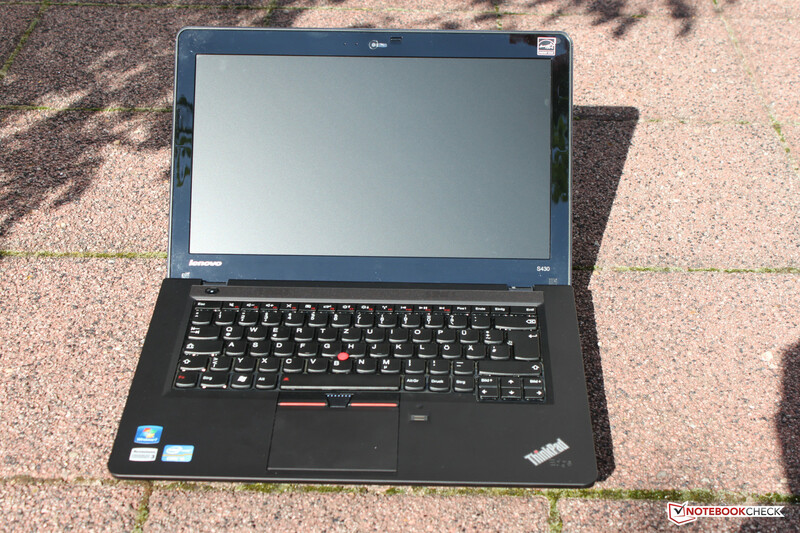 With minimal brightness, activated energy-saving profile and wireless modules turned off, the notebook consumes a frugal 7.4 W - thanks to the integrated graphics card and Ivy Bridge processor. The situation looks different under load. In this case the energy consumption reaches 61 W, which is partially attributed to the dedicated graphics card. We achieved the same results with the Acer TravelMate P643, even though it has a more potent video card. Buyers should not worry about the large power supply. With a specification of 90 W it offers sufficient power reserves. 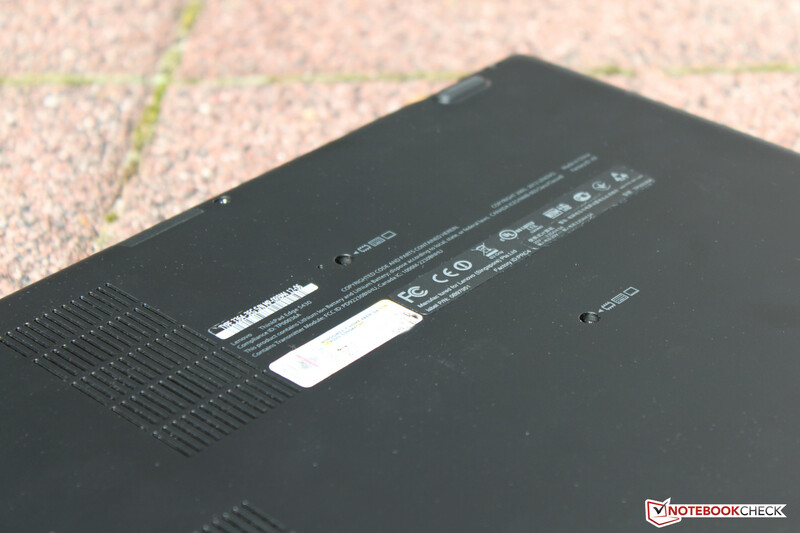 The relatively small battery (48 Wh), compared to the rivals, of the ThinkPad Edge S430 is very noticeable when it comes to the runtime, but is at the same time responsible for the lower weight of the notebook. While in the Reader's test a time of 6 hours and 43 minutes was reached, in wireless surfing the battery was empty after a considerably shorter 3 hours and 51 minutes. In the DVD test we could not quite finish the first four episodes of Battlestar Galactica. After 155 minutes the notebook ran out of steam, with 13 minutes left of the last episode. Under load the situation with the relatively smaller battery is clear: While the TravelMate P643 manages more than two hours (123 minutes), our test notebook shut down after only 86 minutes. 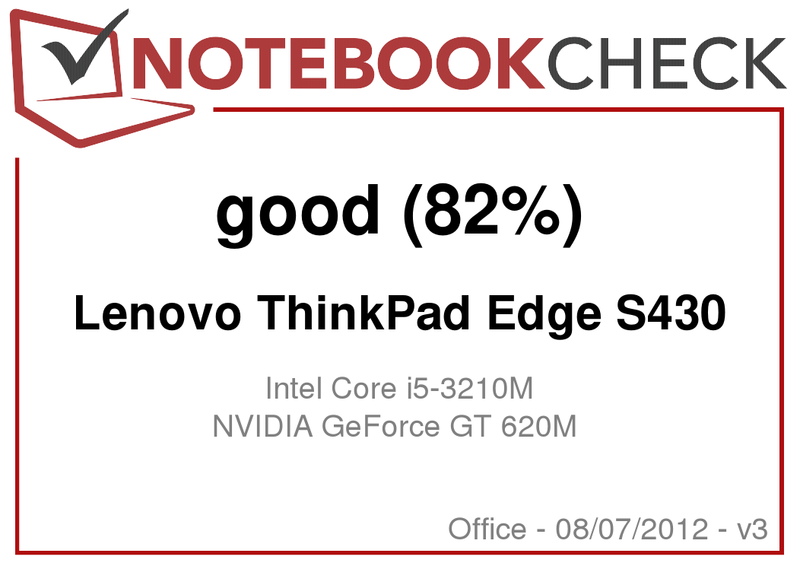 Whoever is on the lookout for an affordable office or multimedia notebook for less than 800 Euro (~$988), should shortlist the Lenovo ThinkPad Edge S430. Especially desk users are going to be happy with the matte and above all high-resolution display, even though in direct sunlight it loses the battle with the sun. The color space is typically very limited for a matte display in this price range. 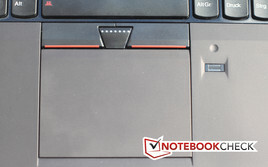 In terms of office use the ThinkPad Edge S430 comes with some, but not all, ThinkPad features. These include among others the good workmanship, which in view of some E400 series models is considerably improved. In contrast to more expensive models the somewhat modern, yet still understated design, convinces us. A docking station is not available for the Edge S430. While the chiclet keyboard satisfied us, we observed a consistent throttling of the GPU frequency. This most noticeably impacted the results in our benchmarks, but remains negligible in practice, unless games are on the top of the list for the user. In addition to the compact 14-inch form factor, the weight speaks for itself: 1.85 kg (~4 pounds) - in this class quite unusual. This is mainly because of the relatively smaller battery, which is noticeable even in daily use - the notebook lasts less compared to the rivals (P643, 8473TG, T420) and must be plugged in the AC earlier than most. 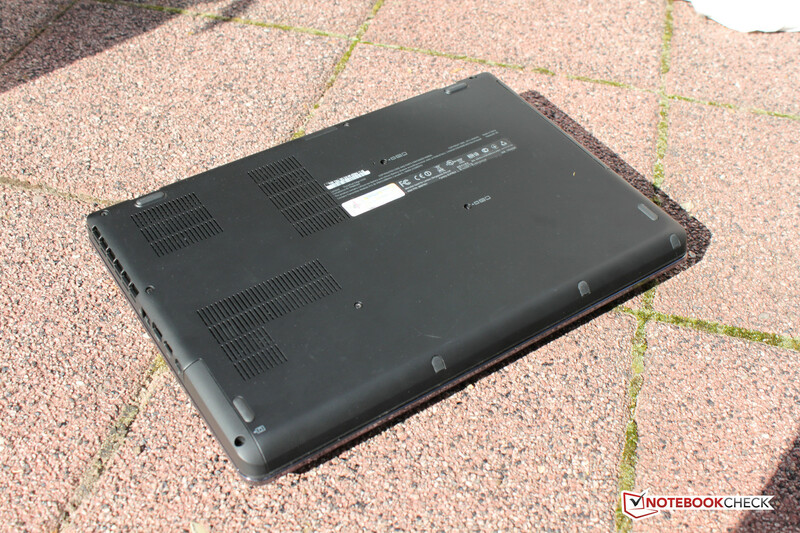 Those who wish to replace the battery or any other components should be aware that the maintenance capabilities are very limited and require an almost complete disassembly of the notebook. Overall Lenovo offers a good deal for the price. Very few notebooks manage to stay under the 800 Euro (~$988) mark, given such workmanship and components. Those interested in the notebook must put up with the somewhat smaller battery and throttled graphics card. ...an optical drive by Matshita is installed. 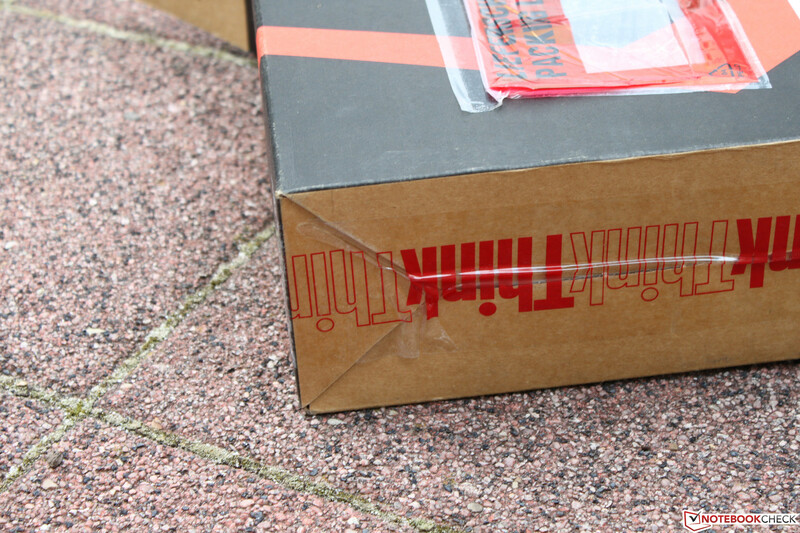 held in position by strong hinges. peripherals can be connected through the Thunderbolt port. Video chats are possible through the HD webcam. good highs, while the bass is completely lost. DVDs can be watched even in brighter surroundings. which goes the bottom side also. and outside there are few distracting elements. which features an accent and is not disturbing. A drawback: fingerprints cannot be avoided. only the hard drive can quickly be replaced. while the layout has been carefully reworked. The F-keys are a bit smaller. alternatively can the TrackPoint be used. ...a good overall package with a few weaknesses. Low weight with decently portable size and a high resolution display. The conservative design the and relatively new chiclet keyboard are convincing. A bit more accessories and above all a VGA or at least a DVI adapter, otherwise presentations on the road might be problem. Another USB port would also not have been a bad idea. 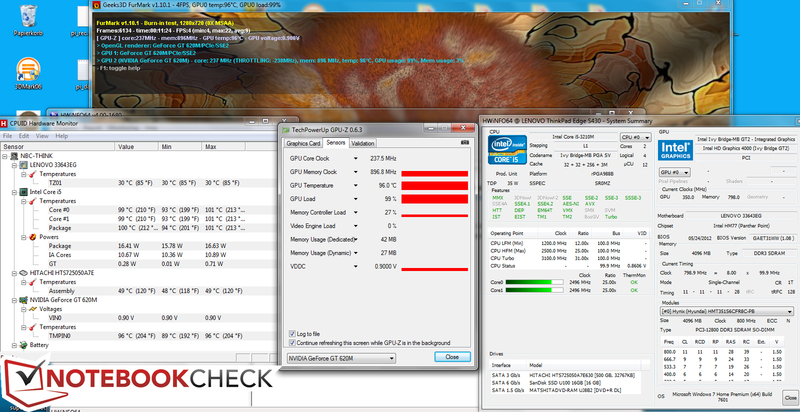 Despite the Ivy Bridge architecture and the GPU throttling, the device becomes properly hot on both the surface and bottom side.